We place our trust in people all the time. We trust drivers will obey traffic signals. We trust our doctor is qualified to care for us. And, perhaps most significantly, we trust our own judgment. So how savvy are we when it comes to believing common cold weather dog myths? As a professional dog walking company, we are always interested in seeing the cold-weather myths that frequently pop up. Dogs, because of their ancestry, have coats and metabolisms designed to withstand frigid weather conditions without significant risk to their health. If below-freezing temperatures are prohibiting you from being outside, your dog shouldn’t be outdoors for an extended length of time. Have a regular dog walking service? Make sure they are adjusting their service to accommodate your dog’s needs! For example, shorter dogs are much more vulnerable to the cold due to their proximity to the ground. Likewise, although a dog’s coat provides warmth and insulation it doesn’t prevent frostbite or hypothermia. To help protect your dog, use an insulated sweater or jacket that covers their neck and belly with “head to tail” coverage – making sure it doesn’t constrict movement. Bottom line, dogs should not be left outdoors for extended periods of time in below-freezing weather. Also, a word to the wise: If you have a busy household with kids and distractions, set rules about who can let the dogs out in the wintertime. In busy households it can be difficult, with all the pandaemonium, to keep track of our dog’s whereabouts. A dog’s paws are Mother Nature’s equivalent of shoes and provide insulated protection against freezing and other dangers encountered in the environment. Paws, as with other extremities of a dog’s body, are susceptible to frostbite if subjected to sustained frigid weather. Make sure your dog walking service is using dog boots for extended walks. When the temperature drops below freezing (32°F), blood vessels close to the skin will constrict in order to preserve core body temperature and divert blood away from the extremities towards the heart and vital organs. Long periods of exposure can cause a critical reduction of blood flow to extremities, i.e., paws, nose, ears, tail, and can cause the tissues to freeze, resulting in severe tissue injury. 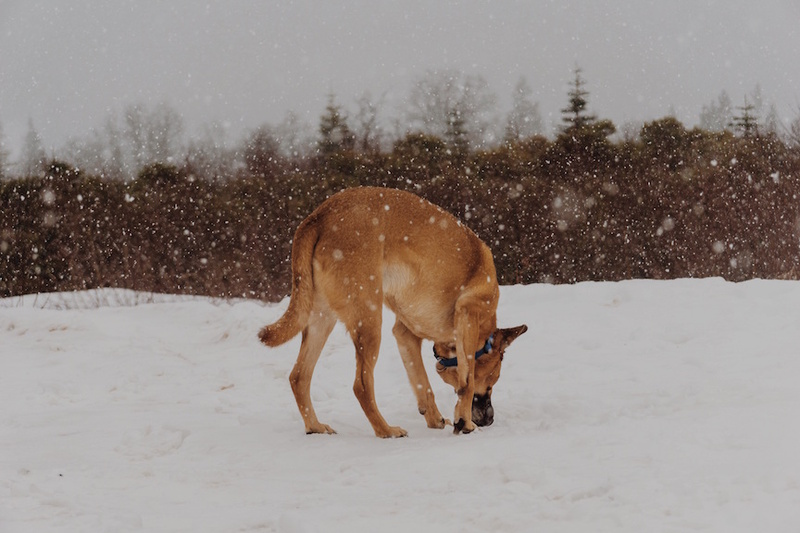 Additionally, dogs who suffer from heart disease, diabetes or other ailments that cause reduced blood flow are more vulnerable in colder weather and at increased risk of frostbite. In addition to dangers brought on by severe cold, a dog’s paws can absorb harmful chemicals and collect substances that can later be ingested. The most common of these in wintertime are chemical ice melts. Avoid salted areas when walking your dog and only use pet-safe ice melts on your property. Likewise, paws have a tendency to dry out in the wintertime and can also “snow ball” in-between toes. If your dog’s pads are dry or cracked, apply a natural emollient like Musher’s Secret®. Trim excess tufts of fur between toes and pads to prevent the formation of ice balls. Last but not least, be sure to examine your dog’s paws after each winter outing. For optimal paw protection, use insulated dog booties to protect your dog’s paws from cold, ice and salt. Our favorite tried and tested outdoor gear company for dogs is Ruffwear.® They have an excellent selection of insulated coats, boots and other gear perfect for your dog. Be sure to follow their fit instructions to insure optimal comfort and benefit. Unlike the danger your car presents in the summertime, your dog is much safer if left in your car in the wintertime. Dogs are no less susceptible to injury in wintertime as they are in the summertime if left inside cars during frigid weather conditions. As professional pet sitters, this is one cold weather dog myth we see all the time – and it needs to be dispelled! Dogs locked in cars is the main reason we have the police programmed in our phones. Let’s be clear, cars act a lot more like a freezers in the wintertime than structures designed to provide warm shelter. Cars are only warm in the wintertime because they have heaters. As soon as the engine is turned off the interior temperature drops precipitously quick. 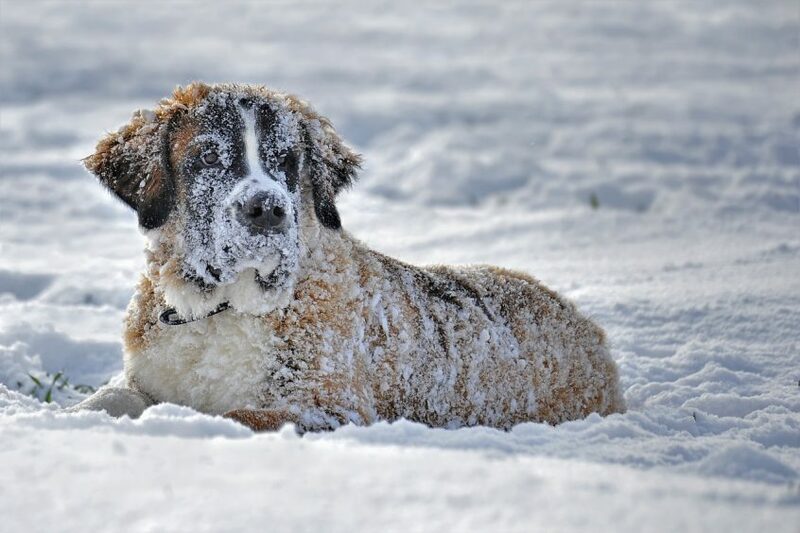 Severe cold temperatures can not only freeze oil, it can freeze your dog. Leave your dogs at home where they’re warm, comfortable and safe. Also, hire Poochy Doos, LLC to walk your dog! Our dog walking program is available year round! We’ll come mid-day to walk your dog, and make sure they’re all dried off and comfy before leaving. Do you have cold weather dog myths you’d like to dispel? Please share in the comments section below. Symptoms of frostbite can sometimes take days to present. If you suspect your dog has sustained an injury from extreme exposure, please consult your veterinarian immediately.